This classic buttermilk pound cake can be baked in a tube cake pan or Bundt pan. The cake makes a delicious base for fresh berries or a dessert sauce, or use it to make pound cake French toast! Buttermilk gives the cake its amazing moist and tender texture, and it adds to the leavening. 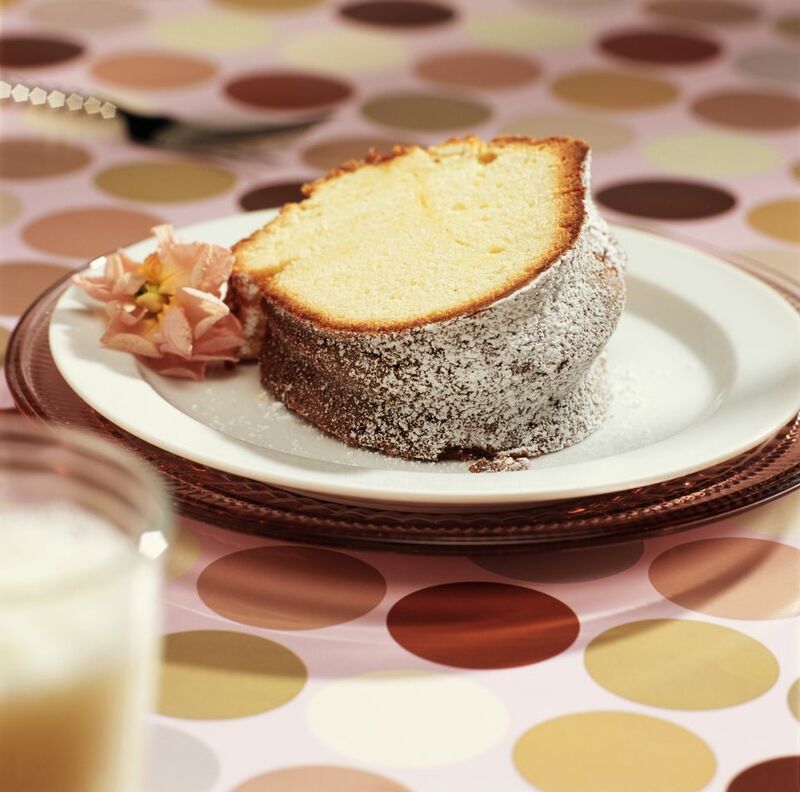 To make a perfect pound cake, see the expert tips below the recipe. Generously butter and flour a 10-inch tube cake pan or Bundt cake pan. Make sure you get all of the nooks and crannies in a Bundt cake pan. In a mixing bowl with an electric mixer, beat the butter and sugar together until light in color and fluffy, about 4 minutes. The air incorporated into the butter and sugar is important to the lightness of the pound cake, so don't skimp on time. Add the eggs, one at a time, blending just until smooth after each addition. Blend in vanilla and almond extracts. In a bowl combine the flour with the salt and soda; blend thoroughly with a spoon or whisk. To the wet mixture, add one-third of the flour mixture and half of the buttermilk; blend well. Repeat with another one-third of the flour mixture and remaining buttermilk; blend well. Blend the remaining flour mixture into the batter. Spoon batter into the prepared baking pan. Bake for about 85 to 90 minutes, or until cake tests done. A toothpick inserted into the center should come out clean, and the cake will pull away from the sides of the pan when done. Cool the cake in the pan for 10 minutes; carefully invert it on a cooling rack to cool completely. Sift confectioners' sugar over the top of the cooled cake or serve it with fruit or lemon sauce. Buttermilk helps break down the gluten in flour, which helps make cakes, pancakes, and other pastries more tender and moist. Baking soda, when added along with buttermilk, produces carbon dioxide gas, which aids leavening along with air and other leavening agents. Before you begin, bring the eggs and butter to room temperature. To hasten the process, put the eggs in a bowl and cover with hot tap water; let them stand for 5 minutes. Cut butter into small pieces so it will come to room temperature quickly. It's important to beat the butter and sugar together for about 4 minutes. The mixture should be fluffy and nearly white in color. The air pockets created by thoroughly creaming the sugar and butter expand during the baking process. Add the flour and liquid in stages and mix gently. Don't overmix the batter all of those air pockets -- added when you creamed the butter and sugar -- might deflate.